Organizational Conflicts of Interests – What are They and What to do with Them? This webinar will cover common types of Organizational Conflicts of Interest that may arise in an academic research setting and provide best practices on how to address them. Handouts will be available 24 hours before the live webinar. Closed Captioning for the live presentation is available at no additional fee. Sign in and click on the "Closed Captioning" link in the handouts tab or in the links box in the meeting room to access this feature. Your registration includes one log-in. We are pleased to provide the opportunity for you to register additional sites at a discounted price of $25.00 per log-in. When you are checking out, click the "Add" button and type in the email address of your colleague that you would like to register. If that person does not already have an NCURA profile, please have them go to the NCURA website to create a profile, then you will be able to register them with your registration. You will be able to change or add more registrations by clicking “My Registrations” in the menu at the top left of the home page, then clicking the “Purchases for Others” button. If you have any questions about this option, please email ncura@commpartners.com. Participants receive 1.5 hours of continuing education credits = .2 CEU's for each webinar. You can access your certificate from the box on the right side of the screen, after filling out the webinar evaluation. Watching in a group? Everyone watching the presentation can request a CEU certificate by writing down the verification code at the end of the webinar. Please make a note of the verification code as it will not be available after the webinar. The main registrant can access instructions on the Group CEU tab for group participants to receive CEU certificates. We recommend testing your browser as soon as possible in case you need to contact your IT department for help. It is recommended that you use a PC or MAC with an updated Internet Browser. Make sure you have pop-ups blockers disabled in your Internet browser settings. Make sure that your internet browser is Active X enabled. Wifi is not recommended. The problem with WiFi is signal strength can vary causing bandwidth to increase or decrease. We recommend a wired connection. A wired connection gives a consistent signal and consistent bandwidth. A wired connection provides a better experience. It's better for organizations with low bandwidth to only have the webinar running on 1 computer in a conference room than having 10 individual people running the session on 10 computers at their desks. Audio (sound) is projected through your computer speakers. Be sure your computer is equipped with speakers so you can hear the presenters. For additional recommendations on your computer set up for the webinar, please click here. This webinar will provide an overview of the impact of the Common Rule (45 CFR part 46) changes on HIPAA (Health Insurance Portability and Accountability Act) (45 CFR Part 160 and Part 164) covered information and biospecimens. (90 minutes) This webinar will provide an overview of the impact of the Common Rule (45 CFR part 46) changes on HIPAA (Health Insurance Portability and Accountability Act) (45 CFR Part 160 and Part 164) covered information and biospecimens. We will discuss the complex and varied updates and issues associated with the Revised Common Rule and how these need to be addressed when working with HIPAA covered information. Participants will be able to understand the role of HIPAA and HIPAA Controlled Data in research. Participants will learn about HIPAA identifiers and biospecimen use in research and how these can now be used in some exempt research. Participants will be able to understand the changes to consent, including broad consent. Participants will learn about the new limited IRB review. This webinar will provide a description of the function of Offices of Inspectors General (OIGs), the OIG’s that impact the research community, and 2019 OIG audit plans. (90 minutes) This webinar will provide a description of the function of Offices of Inspectors General (OIGs), the OIG’s that impact the research community, and 2019 OIG audit plans. Participants will hear specific information related to the NSF OIG, regarding how auditees are selected and changes to the audit process. Case studies describing common audit findings will also be presented. Prerequisites: Participants will want a familiarity with financial audits and an interest in understanding the Inspector General audit environment as it relates to federally funded research. Participants will gain an understanding of how the NSF OIG audit process works and the best ways to minimize the expenditure of resources during an audit. Participants will understand common audit findings identified by the NSF OIG and how to avoid them. This publication explores a number of approaches to conducting assessments and presents models for and considerations when incorporating these activities as a standard management practices. NOTE: To purchase this downloadable publication click the "Register” button. 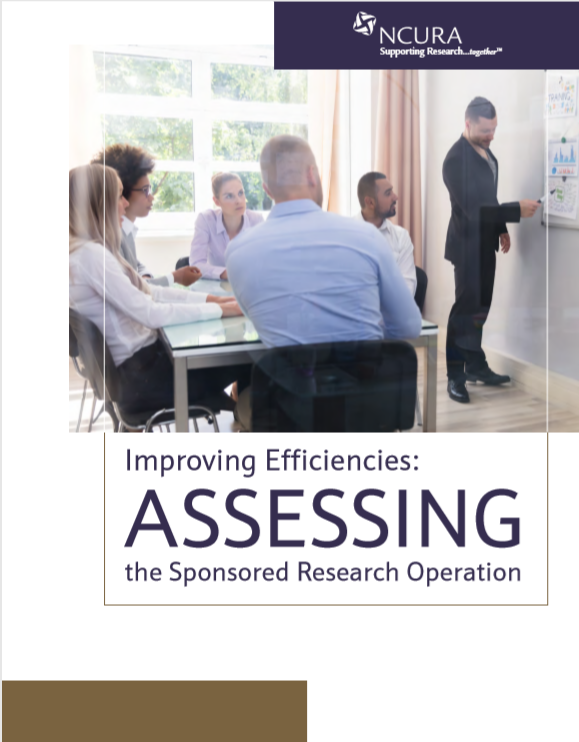 In today’s research environment there is heightened attention on reducing administrative burden and maintaining compliance by both increasing capacity and effectiveness of an institution’s sponsored research operation. This publication explores a number of approaches to conducting assessments and presents models for and considerations when incorporating these activities as a standard management practices. It describes and reviews various assessment mechanisms and ways to use them effectively. Many forms of assessment are possible with a modest investment of resources. It also provides a toolkit of assessment materials that are adaptable to a variety of sponsored programs operations. Exclusively available online. Purchase and download the PDF. Once purchased the PDF will be available for download for 30 days. To purchase click the “Register” button. Chapter 1 What Is Assessment? Why Consider an Assessment Program? What is an Assessment Program? Peggy Lowry has been a team member or lead on almost 50 reviews of research administration offices, received evaluations of her offices, and taught national workshops on sponsored program assessment. She has led office self-studies and participated in institutional accreditation self-studies. Her university career includes 34 years at research universities and 7 years at predominantly undergraduate institutions. Peggy has given over 300 national, regional and local presentations and workshops for multiple organizations. Peggy received NCURA’s Distinguished Service Award in 2006 and NCURA’s Award for Outstanding Achievement in Research Administration in 2011. She began developing the NCURA Peer Programs (Peer Advisory Services and Peer Review Program) in 2007 and served as Director until her retirement in 2018. This workshop provides a primary basis of understanding of proposals to and awards from the National Institutes of Health (NIH). Workshop Time: This virtual workshop will last for 3.5 hours, with a 15 minute break around the 90 minute mark. This workshop provides a primary basis of understanding of proposals to and awards from the National Institutes of Health (NIH). This workshop will give you the basics and we will walk you through the grants process, and give you an overview of key resources and websites you will need to be successful. The program is perfect for someone new to Research Administration, as well as for Research Administrators seeking to expand their knowledge of federal funding agencies. The curriculum provides an overview of the policies and procedures essential to preparing successful proposals to and managing grant awards from the NIH. The On-Demand recording will be available 10 business days after the live presentation. Your registration includes one log-in. We are pleased to provide the opportunity for you to register additional sites at a discounted price of $80.00 per log-in. When you are checking out, click the Add button and type in the email address of your colleague that you would like to register. If that person does not already have an NCURA profile, please have them go to the NCURA website to create a profile, then you will be able to register them with your registration. You will be able to change or add more registrations by clicking “My Registrations” in the menu at the top left of the home page, then clicking the “Purchases for Others” button. If you have any questions about this option, please email ncura@commpartners.com. Participants will be able to describe the organizational structure of NIH and ways it can aid in locating funding opportunities and staff contacts. Participants will be able to provide a high-level explanation of the path NIH grant applications take from submission to award and Post-Award management. Participants will find answers to their questions, whether it be knowing the right website, helpdesk, or staff contact. Participants receive 3.25 hours of continuing education credits = .3 CEU's. Watching in a group? Everyone watching the presentation can request a CEU certificate by writing down the verification code at the end of the webinar. Please make a note of the verification code as it will not be available after the video workshop. In this webinar, we will explore everything that a Departmental Administrator needs to know in working with federal contracts for sponsored projects. (90 minutes) Departmental Administrators are often the key to successful management of federal contracts and sometimes they don’t even know it. They do it all – from the point of identifying a potential contract at the proposal stage, to managing to abide by the terms over the life of the award. The Departmental Administrator is often the central point of contact, supporting the transition from grant funded PI to contract funded PI with faculty. The DRA also supports the central offices with the detailed knowledge and expertise needed at the local level. In this webinar, we will explore everything that a Departmental Administrator needs to know in working with federal contracts for sponsored projects. We will also do exercises and have time for questions. Participants will learn the basic differences between grants and contracts. Participants will explore pitfalls to avoid in dealing with federal contracts. Participants will leave with some best practices in managing federal contracting funding from the Request for Application (RFA) through to Closeout and Audit. This session will focus on how to evaluate GDPR risk and building sustainable privacy programs using real world examples from higher education. (90 minutes) A great deal of confusion is swirling around about the General Data Protection Regulation (GDPR). With GDPR enforcement in full force (as of May 25, 2018) many higher education institutions are struggling with compliance. This webinar will focus on how to evaluate GDPR risk and build sustainable privacy programs using real world examples from higher education. Participants will benefit from a basic level understanding of the GDPR. Participants will leave with an understanding of the regulation and its impact on higher education. Participants will learn to quantify the risk to an institution of higher education. Participants will have a better understanding of data subject rights and how they apply in higher education. Participants will have a better understanding the need and role of a Data Privacy Oﬃcer (DPO). Civility. Compassion. Respect. Kindness. Service. Those related concepts are out of fashion in government and society right now. Let’s look at their place in the world of research administration. 90 Minutes: Civility. Compassion. Respect. Kindness. Service. Those related concepts are out of fashion in government and in society right now. Let’s look at their place in the world of Research Administration. Is it weak or silly to think of civility in a profession grounded in a vast policy and regulatory framework? Is it foolish to think of civility when our conversations with frustrated customers can verge on hostility? Is there really value in taking a compassionate approach when so many people push us for their own timeframes and their own needs? Do we as research administrators have the responsibility to show respect even in the face of anger and frustration? This webinar will be a conversation between the panelists. We will ask questions and challenge assumptions as we discuss the practical and ethical roles of civility in a time of conflict, uncertainty, and volatility. Please join us for this special webinar presentation as we wind down 2018 and prepare for 2019 with a renewed focus on the role of civility in our profession. This is an excellent opportunity to bring your team and constituencies together for this important and timely conversation. We invite you to contact us in advance with questions and comments by sending an email to: kmoreland@rsp.wisc.edu. We will be taking questions and comments throughout the webinar. We look forward to your participation. This session will utilize an interactive, case-based approach to explore the basics of service centers. 90 Minutes: This session will utilize an interactive, case-based approach to explore the basics of service centers. Using a fairly simple service center example, the session will address the calculation of rates based on federal costing standards, controls for compliant operation and considerations for successful service center financial management. Participants will have the ability to engage in a quiz-style format throughout the session and pose questions in a live, interactive forum. Participants will develop an understanding of what a service center includes, and why/when an organization would establish one; will see how service center rates are calculated; will be able to identify common compliance risks associated with service centers; and will learn approaches to better cost recovery consistent with established federal and industry standards. This webinar will be a dive deep into what metrics can really do for us. We will discuss how metrics can help us support and improve our business processes and manage risk at an advanced level. 90 minutes: This webinar will be a dive deep into what metrics can really do for us. We will discuss how metrics can help us support and improve our business processes and manage risk at an advanced level. Over the past decade, many institutions have invested in institutional systems that can be leveraged to support metric analysis. Duke University is one of these universities and they have built a comprehensive structure for utilizing their data to support, build, and manage their operations. At Duke University, they have institutional systems for proposal submission, purchasing, travel, ledger, closeout, post-award processes, training, etc. The data from these systems is integrated to create monitoring metrics for cost-transfers, effort reporting, and other compliance requirements. These metrics are now available for data mining, analysis, and visualization to support the research mission and faculty more effectively. The integrated data supports improved compliance, business operations, workload management and more at the departmental, school, and institutional levels. Also discussed will be what we can learn from the data we gather about awards, proposals, and other key areas. Trend analysis can assist us in forecasting the future as well as identifying our challenges and opportunities. This is an evolving field and, regardless of your institution’s scale, there are numerous opportunities to use your data to understand your institution better. Please join us to further explore what research administration metrics can do for us. Prerequisite: Participants will want involvement with business processes and managing risk at their institution or organization. Participants will be able to describe how a university can utilize data to support, build, and manage their operations. Participants will learn ways that integrated data can support improved compliance, business operations and workload management. Participants will understand some methods that other institutions are utilizing to gather, report, and share metrics. Watching with a group? Everyone watching the webinar, the Lifecycle of the Award Series or the live video workshop can request a CEU certificate by writing down the verification code at the end of each session. Please make a note of the verification code as it will not be available after the conference. After you watch the webinar, the Lifecycle of the Award Series or the live video workshop, please contact the host of your group and ask him or her to login to the webinar page and click on the Group CEU tab. The group leader can email you instructions on how you can obtain your CEU certificate. Group CEUs are not available for tutorials. Refunds of the registration fee, less a $25 administrative and processing fee will be honored if the request is received 48 hours prior to a live webinar by emailing info@ncura.edu. Please note that phone requests cannot be accepted. You may transfer your registration to a webinar on a different date by submitting this request 48 hours prior to a live webinar. There is no fee to transfer dates. Tutorial cancellations should be made prior to logging into the first lesson. © 2019 NCURA. All rights reserved.